We heard several days ago that the Falcons were interested in trading into the Top 10, and that they had their sights set on defensive linemen like Christian Wilkins and offensive linemen. Tom Pelissero of the NFL Network confirms that Atlanta is indeed interested in moving up, but his sources say the club’s target is actually linebacker Devin Bush (Twitter link). Per Pelissero, the Falcons would need to leapfrog the Broncos, who hold the No. 10 overall pick, to assure themselves of landing Bush. Despite all of the rumors suggesting that the Redskins are interested in making a big trade up into the Top 5, Pro Football Talk says that all of the calls that team president Bruce Allen are making are just an example of Allen being Allen and that Washington doesn’t really have a desire to make a move (Twitter link). Adam Schefter of ESPN.com tweets that the Rams, who hold the No. 31 overall pick in tonight’s draft, have received a number of calls from teams wanting to trade into the back end of the first round. First-rounders, of course, can be kept under club control for five years instead of four. As Pelissero notes in a separate tweet, the teams that have shown the most interest in trading down from their current first-round slots are the Jets (No.3), Lions (No. 8), Dolphins (No. 13), Seahawks (Nos. 21 & 29), and Rams (No. 31). If Kyler Murray should start to fall down the draft board, he may end up having a better financial future in baseball. As Albert Breer of SI.com notes, MLB’s Oakland A’s have offered him a $14MM “sweetener” on top of the $4.6MM bonus he was already due after the club drafted him last year, for a total of $18.66MM. That number would land between the 10th and 11th overall picks in tonight’s NFL draft, so if Murray ends up falling that far, teams are concerned that he would return to the diamond. But Breer still thinks that Murray will be the No. 1 overall pick tonight. Breer calls Mississippi State defensive tackle Jeffery Simmons the most interesting prospect in the draft. He is one of the top defensive players in his class, but the troubling video showing him striking a woman in high school, along with his ACL tear, have completely removed him from some teams’ draft boards. But there is still a good chance that he will be selected in the first round tonight. The Panthers and Vikings are both very serious about addressing their needs along the offensive line with early draft picks, as Breer notes in a separate piece. Both clubs used a high number of top-30 visits on O-linemen. LSU cornerback Andraez “Greedy” Williams is perhaps the most talented corner in the draft, but as Breer notes, he comes with plenty of red flags concerning his toughness, work ethic, and personality. He did not make a single pre-draft visit, and despite his upside, he could slip out of the first round. The Browns are asking the NFL to allow Kareem Hunt to remain with the team during his eight-game suspension, a source tells Mary Kay Cabot of The Plain Dealer. Players are typically banned from the team facility and all activities during personal conduct policy suspensions, but the club is looking for an exemption in Hunt’s case. It sounds like GM John Dorsey will consider Mississippi State defensive tackle Jeffery Simmons in the upcoming draft, despite his red flags. “I think from your standpoint, what you should do is you should talk to the coaches and the support system at Starkville, Mississippi State, and just see what kind of man that guy really is,” Dorsey said (via Nate Ulrich of the Akron Beacon Journal). The Browns might not be able to land Simmons with their first pick at No. 49 overall, but trading up is always a possibility. Matt Barrows of The Athletic believes the 49ers would jump at the chance to trade for Odell Beckham Jr. if the Giants actually make him available, but Barrows is more skeptical about San Francisco’s interest in Antonio Brown. It has been rumored that Brown’s preferred destination is the 49ers, but Barrows says San Francisco would only be a serious suitor for Brown if the Steelers’ trade demands are modest. Of course, we recently heard that Pittsburgh may not get more than a third-round pick for AB, so maybe that is modest enough for the Niners to take the plunge. In the same piece linked above, Barrows writes that the 49ers must re-sign guard Mike Person, and he says the club plans to meet with Person’s agent at the Scouting Combine this week. Ian Rapoport of NFL.com tweets that the Giants are expected to hire Everett Withers as their new DBs coach. Withers spent the last three seasons as the head coach of Texas State and had previously agreed to become the defensive coordinator for Florida International in 2019. He will take over for Lou Anarumo, who left Big Blue to become the Bengals’ DC. Former Bengals RBs coach Kyle Caskey will join the Lions in the same capacity, per Aditi Kinkhabwala of the NFL Network (via Twitter). It is a logical hire for Detroit, as Caskey did good work in his five years coaching Cincinnati’s running backs. Colts WR Marcus Johnson, an exclusive rights free agent, has been cleared to resume football activities, Johnson himself tweeted. Johnson was placed on IR in October. 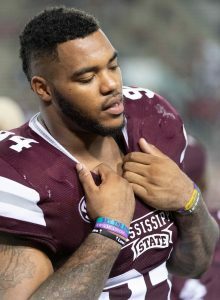 Mississippi State defensive tackle Jeffery Simmons is not at this week’s Scouting Combine in Indianapolis due to his surgery to repair a torn ACL (plus, while he would have been permitted to participate in limited interviews and undergo medical testing, he was banned from participating in drills). However, Tom Pelissero of the NFL Network tweets that Simmons will attend the medical recheck in Indianapolis in April, which will give interested clubs the chance to see how his recovery is progressing. Mike Florio of Pro Football Talk points out an odd quirk in the league’s rule concerning a prospect’s eligibility to fully participate in the Scouting Combine. Since the ban on drills that players like Simmons have faced only encompasses convictions, that means that players who have not been convicted of a crime but who are still facing potentially serious charges — like Wyoming DE Carl Granderson — are allowed to participate in all aspects of the Combine. Of course, current NFL players may face league discipline even if they avoid legal repercussions for their misdeeds, so Florio believes the rule banning prospects only if they have been convicted of a crime should be eliminated. Appearing on The Mighty 1090 (audio link), draft guru Tony Pauline expressed his belief that Oklahoma QB Kyler Murray will definitely be drafted in the first round; it is merely a question of where in the first round he will fall. Former Redskins head coach Jim Zorn, who also served as the quarterbacks coach for five different NFL clubs, has been named the head coach and GM of the XFL’s Seattle franchise, the league announced via Twitter. Mississippi State defensive tackle Jeffery Simmons, projected to be a top 15-pick in the NFL Draft, suffered a torn ACL while going through position drills last weekend, according to Simmons himself. Simmons posted a statement on his Twitter account indicating that he will have surgery early next week. Adam Schefter and Chris Mortensen of ESPN.com (on Twitter) first reported that Simmons sustained a knee injury, and Ian Rapoport of NFL.com tweeted that the injury is a torn ACL and that a surgery is forthcoming. Of course, Simmons’ status as a top draft choice is now very much in flux, as he will probably be sidelined for his entire rookie year. Simmons, who stands 6’4″, 300 pounds, appeared in 37 total games in his three-year career with the Bulldogs, managing 159 tackles (30.5 for loss), six sacks, and five forced fumbles during that time. He was named first-team All-SEC in both 2017 and 2018, and this season won the Conerly Trophy as the top college football player in the state of Mississippi. Even before the injury, Simmons had some red flags. He was arrested for simple assault in 2016 after repeatedly striking a woman, though, for his part, Simmons says he was attempting to stop said woman from assaulting his sister. The incident occurred just before Simmons began his collegiate career and he was allowed to enter MSU while completing counseling programs. Williams was later arrested in 2017 for an altercation involving a woman. As a result of those issues, Simmons was barred from participating in the draft combine. The NFL Draft scouting combine is weeks away, but one of this year’s top prospects will not be taking part in the event. Mississippi State defensive tackle Jeffery Simmons, a potential top 10 pick, will not be invited because he does not meet the criteria for the NFL’s policy regarding past issues involving violence, Tom Pelissero of NFL.com hears (Twitter link). The same goes for Colorado State wide receiver Preston Williams. Simmons was arrested for simple assault in 2016 after repeatedly striking a woman. For his part, Simmons says he was attempting to stop said woman from assaulting his sister. The incident occurred just before Simmons began his collegiate career and he was allowed to enter MSU while completing counseling programs. Williams, meanwhile, was arrested in 2017 for an altercation involving a woman. So far, these are the only two known players to be barred from the combine for this year, sources tell Pelissero. However, invitations have been pulled in past after failed background checks. Despite the red flags, Simmons is widely expected to be an early first-round selection. CBSSports.com ranks him as the draft’s No. 7 overall prospect. Mississippi State defensive tackle Jeffery Simmons will forgo his final season of collegiate eligibility in order to enter the 2019 NFL draft, as Simmons announced on Twitter. Simmons is widely expected to become an early first-round selection, and CBSSports.com ranks him as the draft’s No. 7 overall prospect. From a scouting report perspective, The Draft Network says Simmons has effective hand usage and a “hot motor,” but “lacks a consistent anchor” and struggles with two-gap responsibilities. Talent aside, Simmons has an off-field red flag on his record, as he was arrested for simple assault in 2016 after repeatedly striking a woman. The incident — during which Simmons says he was attempting to stop said woman from assaulting his sister — occurred the spring before Simmons began his collegiate career, but he was allowed to enter MSU while completing counseling programs.